The Altar Servers form a very important part of the church and the St. Therese community is blessed with many young people who serve. It is a great way for our youth to be actively involved in the liturgy. When we do something for God’s people, we give worship and honor to God. 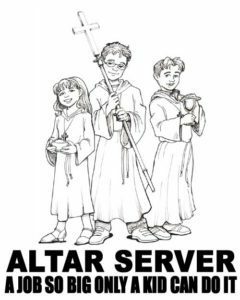 If you are interested in having your son or daughter become an altar server, please contact the St Therese Altar Server Coordinator, Louis Giannone, (“Mr. G.”) at LouisGiannone@gmail.com or contact the front office at (561) 784-0689. Oh Jesus, my King and Lord, by the grace of the heavenly Father and the power of the Holy Spirit, guide me in all righteousness as I serve You today at the Altar so I may be always worthy of Your presence. If I happen to make an error, may it be a lesson so my service will be perfect tomorrow. Jesus, I love you with all my heart. Amen.